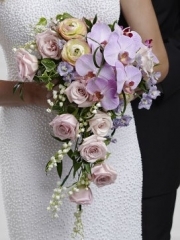 A simple yet incredibly beautiful bouquet, which exudes pure elegance and feminine charm. Pale pink mini calla lilies, roses and dahlias are arranged in a cascade style and accented with a white taffeta ribbon to create an unforgettable look. Calla lilies are a popular choice for brides and it's easy to see why. These elegant flowers have a chic appeal and will accessorise a wedding dress just beautifully. This deep pink hand-tied bouquet is finished with pearl pins and pearl edged ribbons for a special finishing touch. This blushing bouquet will make any bride smile. Gorgeous pink peonies show off their amazing texture accented with white stephanotis blooms and tied together at the stems with a brown shiny taffeta ribbon to create a bouquet you will never forget. Approx. 11-inches in diameter. A Floral Jewelled Ring Box is a stunning alternative to the traditional ring bearer pillow. Pink garden roses, pink roses, pale pink hyacinth and pale pink spray roses are accented with seeded eucalyptus and arranged to top a box covered in white ribbon and pixie pearl pins. Approx. 5"H x 5"W.
This is a wonderful way to add that extra special touch to your veil. Beautiful lily of the valley, fragrant hyacinth and blush dendrobium orchids are brought together to form an exquisite hair accessory to make you look your bridal best. Approx. 3"H x 6"W.
The Pink Spray Rose Boutonniere is a beautiful departure from the standard rose boutonniere. Adding texture and interest, a single pink spray rose bloom is brought together with variegated ivy and tied together with a silver metallic wire to create a presentation of simple elegance. Approx. 4"H x 2"W.
The Heavenly Scent Bouquet is a display of blushing sweetness full of feminine charm. Pink roses, tulips, spray roses and sweetly scented hyacinth are brought together to form a bouquet that is both eye-catching and elegant tied together with a pink satin ribbon for a complete look. The Pink Mokara Orchid Boutonniere brings an exotic sophistication to the overall look of your groomsmen. A fuchsia mokara orchid bloom is accented with a single green button pom and secured on a equisetum stem to create a modern take on the traditional boutonniere. Approx. 4"H x 2"W.
For a fresh burst of colour to add to the magic and romance of your wedding day choose a bouquet of pink lilies. oriental lilies and asiatic lilies are brought together with eye-catching stargazer lilies, all beautifully accented with red hypericum berries and lush greens. A bright and beautiful way to add to the colour and beauty of your wedding day. Fuchsia roses will get their attention arranged amongst pink sweet pea stems, bi-colored pink roses, and pink cyclamen, tied together with a silver grey satin ribbon, to create an elegant and charming bouquet. Approx. 13"H x 8"W.
This stunning candle arrangement is the perfect way to symbolise two lives becoming one partnership. Pink roses, peonies, larkspur, hydrangea and astilbe are accented with variegated ivy and arranged to perfection surrounding two taper candles and a single pillar candle. This is the perfect flower girl basket, exuding a sweet charm. A white bamboo basket is cleverly covered in pink spray rose petals to give this piece a dream-like quality. Holding white rose petals to be sprinkled down the aisle, this basket is the perfect fit for any wedding. Approx. 10"H x 7"W.
A real statement bouquet for your special day, this design features pink roses, larkspur, and LA Hybrid lilies, accented with white genista and variegated ivy. Tied together at the stems with a silver grey satin ribbon, this bouquet brings a sweet sophistication to your big day. Approx. 24"H x 14"W.
Delightful pink gerberas are arranged to form a beautiful cluster of colour, tied together with a pink satin ribbon to create a bouquet of soft elegance. An expression of happiness and sweet simplicity to add that extra touch to the wedding day. Approx. 13"H x 8"W.
A Pink Alstroemeria Boutonniere adds a colourful flair to your wedding party. Beautiful Peruvian lily blooms are brought together with green hypericum berries and tied together with a silver metallic wire for a simply stylish look. The Pink Cymbidium Orchid Boutonniere brings a fresh elegance to the look of your wedding party. A single cymbidium orchid bloom is secured to an equisetum stem and accented with a cyclamen leaf to bring a simple style of blushing sophistication to your big day. The precious pinks wedding collection on offer here at Aberdeen flowers is a gentle and lovely alternative to the traditional white colour schemes. There are several lovely wedding flower collections on offer here so no matter what it is you’re after, you will find something absolutely perfect for your wedding with us. You can browse online through our different wedding collections from passionate reds to alluring autumn and, of course, the precious pinks range however if there’s nothing which catches your eye, don’t worry. Aberdeen flowers offer a bespoke service which gives you complete control. The bespoke service enables you to specify what flowers you would like, what flowers should be avoided at all costs, colour schemes and preferences and what sort of floral designs you’re after. Once we have all the necessary details, our team of expert Aberdeen florists will turn all of your ideas into a beautifully arranged reality. All the flowers the florists here work with are of the finest quality as all of our flowers have been imported directly from Holland. Holland, the western region of the Netherlands, has gained worldwide acclaim for cultivating some of the finest flowers in the world. We at Aberdeen flowers can wholeheartedly agree with this as our flowers are always beautiful and with over four deliveries per week, they are also always the freshest. The freshness of a flower directly impacts the longevity so the fresher the flowers, the longer they will last. If you have any further queries regarding any of the services provided by Aberdeen flowers, please do not hesitate to get in touch. You are able to contact us either by phone or email as there is always a member of our team readily available to answer any and all of your questions. If you are a guest attending a wedding and find yourself in need of some flowers, such as wearable flowers, then you’ve come to the right place as we have a gorgeous selection of flowers to wear here at Aberdeen florists. We have a range of gorgeous buttonholes and corsages, both of the pin and wrist variety, available which you can browse online. We understand that each corsage and buttonhole is unique as it is usually designed to match a specific dress or outfit which is why each flower to wear is made to order. This means that your order is tailored specifically to your tastes and needs. Alternatively, if you’re not entirely certain what it is you’re after, you are able to leave your order up to the florist’s choice. So, once we know what your occasion and colour schemes are, the talented florists in Aberdeen will craft something absolutely charming for you. We have over forty years of experience under our belts here at Aberdeen flowers which means we have catered for a countless number of weddings. We understand that your wedding day is one of the most important occasions in your life and we want nothing more other than to provide you with sheer perfection. When it comes to wedding flowers, we always recommend booking a consultation. This gives you the chance to have a one on one chat with the florist who will be coordinating your wedding flowers. You can tell us exactly what it is you’re after, have a flick through our in store wedding portfolio and it will also ensure we are one hundred per cent confident as to what it is you’re after. At Aberdeen flowers, customer satisfaction is the number one priority which is why once your order has been placed, we will take care of everything on your behalf.